We change our wardrobes as the seasons change. How about your hair? Do you change the way it looks? The way you care for it? It’s getting hot out there! Have you been ignoring your hair all winter? It’s time to get your locks summer ready with John Frieda! We have all been there, wanting those luscious beachy waves but a quick trip to the beach is just not an option. Luckily, John Frieda’s new Beach Blonde products have come to the rescue. Want to know the best part? These new products apply to women of all hair color- not just blondes! To get the full affect of these beachy waves, we love starting the process with the Beach Blonde™Cool Dip™ Shampoo & Beach Blonde™Smooth Seas™ Conditioner because together they nourish and add texture prepping our hairstyle. To achieve our effortlessly undone and carefree beachy style, we finish up with the Beach Blonde™Sea Waves™ Sea Salt Spray. So all of you out there, who want to check out this new product line, just get yourself to Target and you will be looking like a beach babe in no time. This entry was posted in Hair on July 6, 2015 by Chrysa. As summer gets into full swing and the weather beings to warm, our hair starts bearing the full effects of all that sun. While we might enjoy spending some time in the sun, sometimes our hair just can’t stand the heat. For many of us, the summer heat means dry, dull hair that really needs some moisture! 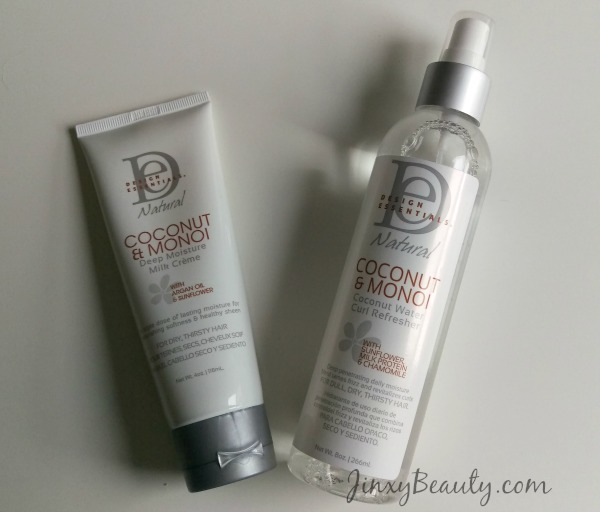 To come to the rescue with some relief, Design Essentials Natural is helping to quench thirsty hair with their new, all-natural Coconut & Monoi Deep Moisture Collection. 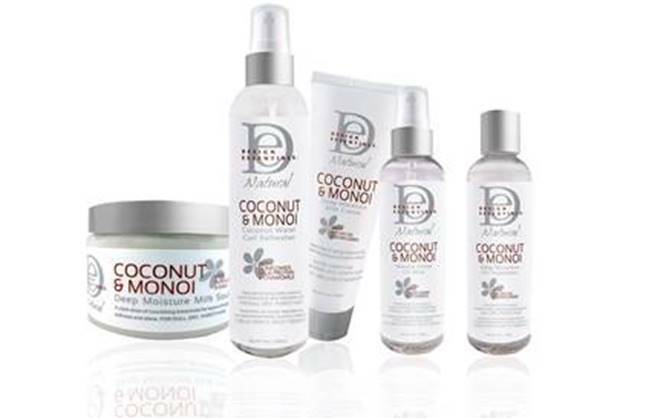 Each product in the collection has a formula that is expertly designed to deliver maximum hydration to the hair using nourishing botanicals and the oils of Coconut & Monoi, a fun and tropical combination perfect for the summer season! The Coconut & Monoi Deep Moisture Milk Creme utilizes a nourishing blend of Argan, Olive, and Sunflower oils to deliver intense hydration to your hair. It’s great for finishing styles to minimize frizz and flyaways, and is suitable for all hair textures. Coconut & Monoi Coconut Water Curl Refresher revitalizes curls with our triple hydrating Monoi Moisture Blend. With daily use, minimize your frizz and extend the life of your styles without shampooing. The Design Essentials Deep Moisture Milk Souffle with Sunflower & Shea is a nourishing styler for lightweight, frizz-free hair. It can be used on wet or dry hair, and is ideal for all hair textures! Coconut & Monoi Deep Moisture Oil Treatment with with Argan & Sunflower Oil is infused with nourishing botanicals and revitalizing antioxidants to instantly start the repair process for damaged hair. Renew strength and elasticity while shielding the hair from the damaging elements! The Coconut & Monoi Intense Shine Oil Mist instantly soothes dry, brittle hair to leave each strand perfectly nourished and conditioned with a luminous shine! Its hydrating and strengthening properties even help to mend split ends! My curly hair has loved starting out the summer using a combination of the Coconut & Monoi Deep Moisture Milk Creme and the Coconut & Monoi Coconut Water Curl Refresher to revive my summer waves and curls. The Coconut & Monoi Intense Shine Oil Mist also gives my hair a nice finishing touch. Plus, I cannot fail to mention the AMAZING smell. It has a nice, light coconut smell. I look forward to that smell every morning now! Design Essentials Natural recommends combining these products to shield your hair from the heat and keep it hydrated this summer! For more information on Design Essentials and their entire line of products, please visit www.designessentials.com. Do summer extremes dry out YOUR hair? This entry was posted in Hair on May 26, 2015 by Chrysa. Now get the color you need for your hair! Madison Reed offers easy-to-apply hair color delivered to your door on YOUR schedule. This entry was posted in Hair on April 10, 2015 by Chrysa. Which Celebrity Hairstyle Are You? Win the Look Reader Giveaway! 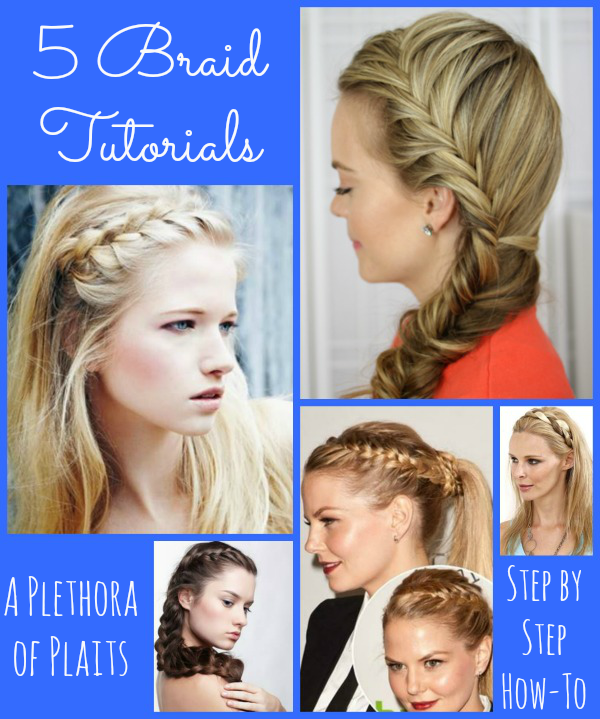 Do you have a celebrity hair style that you totally love, but need a little help to achieve? 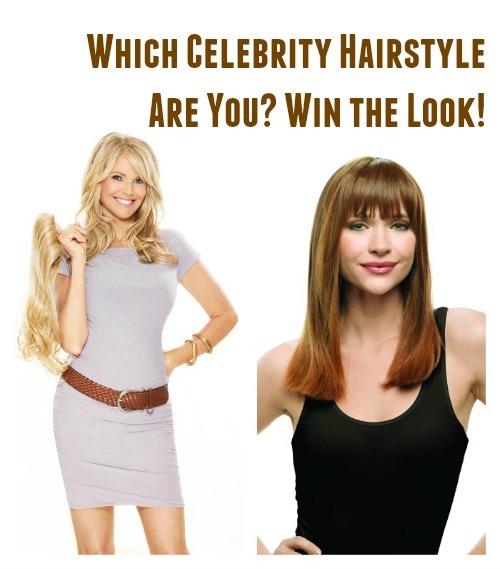 Take this “Which Celebrity Hairstyle Are You?” mini-quiz and enter for a chance to win a matching extension piece from Hair2Wear and HairUWear to recreate their look! Reader Giveaway: One lucky Jinxy Beauty reader will win an extension piece from Hair2Wear and HairUWear. To enter, just complete the entry form below by 11:59pm ET on 3/3/15. Good luck! This entry was posted in Giveaway, Hair on February 15, 2015 by Chrysa. On the arm of her Grammy-nominated artist husband John Legend, Chrissy Teigen took to the 57th Annual Grammys Red Carpet last night in heavenly white Versace and her hair in Angelic Beach Waves to match. Want to know how to recreate that look? Luckily for us, the creator of her style, Celebrity Hairstylist and Macadamia Professional International Creative Director Giannandrea, shared his “how to” for achieving this sultry silhouette. Start with wet hair and apply Macadamia Professional Foaming Volumizer($25) to crown only. 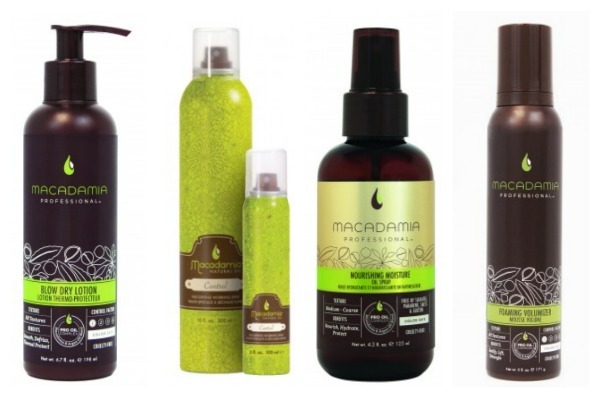 Apply Macadamia Professional Blow Dry Lotion($24) through the entire length of the hair. Blow dry large sections with a large round brush to increase volume all over, especially on the top layers. Part hair down the middle. Starting slightly below the crown, wrap small sections around a ¾-inch curling iron. Use a flat iron to gently flatten the waves, making sure to keep the waves and not to remove the roundness. Flatten the ends for an edgy finish. Spray each section with Macadamia Control Working Spray($23) to hold and set the waves. Using hands, run Macadamia Professional Nourishing Moisture Oil Spray($31.95) throughout the length to increase shine and supple texture. Reader Giveaway: One lucky Jinxy Beauty reader will win Macadamia Professionals Control Working Spray. 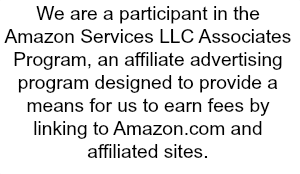 To enter, just complete the entry form below by 11:59pm ET on 2/24/15. Good luck! This entry was posted in Giveaway, Hair on February 9, 2015 by Chrysa. Do you color your hair at home? 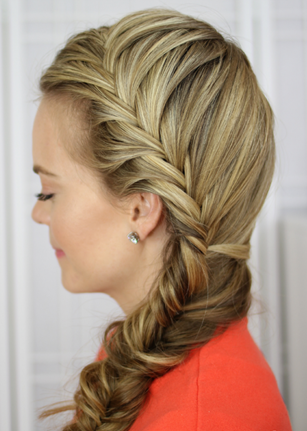 If you have been nervous to color your own hair – it’s so easy!! While I do usually like the results of salon coloring, it involves so much time and expense that I appreciate the convenience and the savings of doing it at home. The more you understand it, the more control you’ll have over the results. Our friends at Madison Reed have five easy tips to get and keep better hair color. Semi-permanent color, also known as hair gloss, is a beautiful hair multi-tasker! You can also use clear gloss to deep condition and add light-reflecting shine, or tinted shades to brighten faded color and add shine, tone and dimension. Check out all the new Color Reviving Gloss from Madison Reed – available in 8 great shades. Picture your hair color as physical pigments that need help to stay in your hair. Madison Reed’s nourishing color enhancing Shampoo and Conditioner Set is designed to extend the life of hair color by being more gentle and healthier for your hair. This enables the color pigments to stay longer because they’re not being stripped out of your hair. Over time, using haircare that repairs and protects your hair also helps it become less porous (remember my explanation at the top?). All of these things work together to help your hair look and feel better the more you use healthier products! This entry was posted in Hair on January 30, 2015 by Chrysa. Tips for Curly Hair – Love those Curly Tresses! Curly hair can be lots of fun and very beautiful! With the help of these easy tips from Tamika Claridy, Manager & Senior Stylist at Symbols Salonm curly girls can embrace their tresses and maximize their natural beauty! 1. By nature, curly hair bestows a very porous texture so it requires lots of moisture. Claridy recommends cleansing with a hydrating or moisturizing shampoo and conditioner. It’s best to shampoo on alternating days or even every two days as shampooing every day can cause dry hair and scalp. 2. Use a leave in conditioner and make sure the hair gets fully saturated. This will keep the hair conditioned, soft and moisturized. 3. Use a dime sized dab of product for especially created for curly hair such as curl creams or balms. Claridy recommends creams and balms because they won’t dry the hair out and they leave the hair soft and natural looking. Bonus tips: Always use a shampoo formulated for curly hair. Claridy does not recommend using hair gel or mousse because it can cause the hair too be dry. Located in Downton Miami, Symbols Beauty Salon is a 2,500 square foot full service salon and day spa that provides a harmonized and creative and inviting environment for all things beauty and head to toe pampering. Taking a cue from European Salons, Symbols merges the glamourous worlds of beauty fashion and style for a one stop shop beauty concept. The sleek, state of the art salon is equipped with the most innovative beauty technology for the ultimate in luxe pampering including touches such as shampoo chairs that provide massage and soothing light therapy to reduce stress and calm the mind. 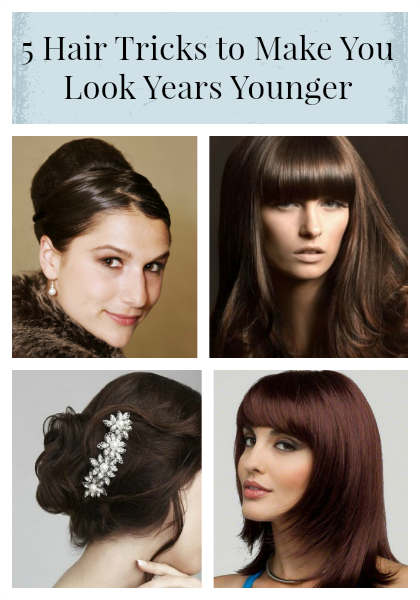 This entry was posted in Hair on January 16, 2015 by Chrysa. As usual, the fashions and hairstyles at the American Music Awards go hand in hand with the music for top-billing for the evening. There were some gorgeous dresses on hand and equally beautiful hairstyles. I personally loved Julianne Hough’s slick and simple do. To help you Recreate AMA Hairstyles at home, Jenny Balding, Cutler/Redken Stylist, shares two of her favorite looks from tonight’s 42nd Annual AMAs – Rita Ora & Julianne Hough and how to achieve the look for yourself. Start by blow-drying all your hair back and off your face. Create a deep side part of whatever side that suits you best. Starting at the back use a gel that has hold and creates shine for best results. Take small sections at a time and apply the gel and comb through each section. Continue until you reach the front hairline a sweep back off your face also. It’s important to start at the back to make sure every strand is coated with gel to create the ultimate sleek style. Use a sleek balm through the roots to tame and smooth the flyway’s. Cutler flyaway stick is the perfect product for this as the more you use the more it will hold and create sheen. Sweep into a really high ponytail that sits right on top of the crown. Use a straightening iron on the ponytail to create a super sleek finish. Wrap around the base of the ponytail, section by section until the last section of hair leave about 2″ of hair out to create Rita’s topknot. Finish by misting Redken Diamond Oil High Shine Airy mist to achieve exceptional shine. This entry was posted in Hair on November 24, 2014 by Chrysa. As the holidays approach, you can get ready to roll back the calendar with 5 Hair Tricks to Make You Look Years Younger this Holiday Season from Madison Reed. Turn back the clock with a bang! It’s amazing how bangs can softly cover and ease those worry creases in your forehead and somehow harken to a childlike look. 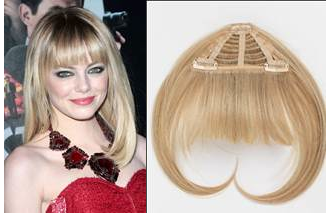 Bangs can be layered, side swept, choppy or straight. A beautiful bang can be better than Botox! Reverse gravity with an updo! Going vertical offers an instant facelift! A romantic updo can work against the horizontal lines in the face that come with age like crow’s feet and nasolabial folds or laugh lines. It also brings the focus up to your eyes where all of the sparkle and magic happens. Decorate your hair for the upcoming celebrations! 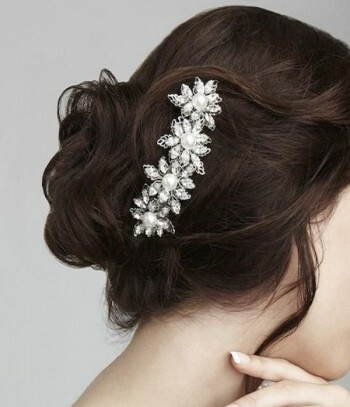 A hair ornament or two make you look fresh, and festive. 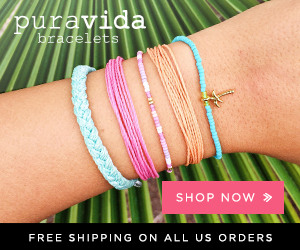 There is something about adding jewels that brings out our inner princess. Ran out of time for a full hair coloring before the next holiday party? Don’t let that be your excuse for letting your roots run wild. 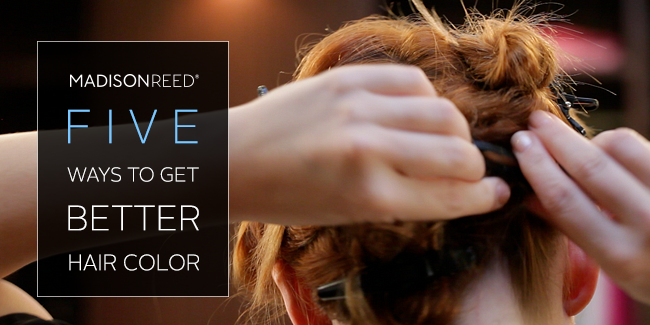 Look your brightest and shiniest with a quick blending of the perfect color on your hairline. Madison Reed’s Root Touch Up comes in a full spectrum of colors to conceal roots and grays on the go. Why settle for the same old, drab color? Even if you are not covering grays, roll back the years by adding tones in your hair that compliment your skin tone and eyes. This makes a profound difference in the way that you look. Think of how you look in a color that does not compliment your skin tone versus a color that lights you up! Imagine your crowning glory creating that effect every day! For cool complexions on brunettes, consider mahogany, deep reds and chocolates and for cool blondes, go for minky, smoky tones. For warm complexions on brunettes, add cinnamon and gold tones and for warm blondes, wheat and honey tones. Brightening and refreshing your color will literally turn back the clock! Find your perfect hair color now with Madison Reed! This entry was posted in Hair on November 13, 2014 by Chrysa.